Copyright is the legal protection of literary, dramatic, artistic, and musical works, sound recordings, performances, and communications signals. Copyright provides creators with the legal right to be paid for—and control the use of—their creations. In Canada, copyright is protected through the federal government’s Copyright Act. the rights of the education community to have fair access to created works. The CMEC Copyright Consortium is composed of the ministers of education of Canada’s provinces and territories, with the exception of Quebec. Canada’s copyright law became clearer and easier for teachers and students to follow in 2012. Federal copyright legislation passed by Parliament in June 2012 and a Supreme Court decision in July 2012 changed the rules for the educational use of copyright-protected materials. The federal copyright law establishes the legal framework for the digital age. For example, a provision in the Copyright Act regarding the educational use of the Internet allows students and teachers to use publicly available Internet materials for their learning and educational pursuits without violating copyright. The July 2012 Supreme Court decision clarified what fair dealing means in an education setting. According to that decision, teachers in Canada may make copies of short excerpts of a copyright-protected work for students in their classes without having to obtain copyright permission or pay copyright royalties. The Copyright Consortium of the Council of Ministers of Education, Canada (CMEC), released the Education Ministers’ Policy Statement on Fair Dealing on March 7, 2018. The CMEC Copyright Consortium developed this statement to underscore its support for the educational use of the fair dealing provision of the current Copyright Act and for the copyright policies and procedures in use by elementary and secondary schools, in response to the 2012 Supreme Court of Canada decision on copyright and the educational use of fair dealing. 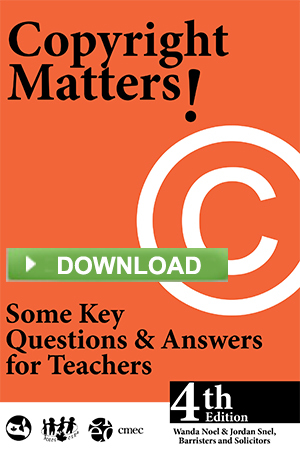 The CMEC Copyright Consortium publication, Copyright Matters!, 4th Edition, provides the education community―teachers, students, parents, and administrators―with user-friendly information on copyright law. Copyright Matters! covers items from the Canadian Copyright Act, contractual and tariff arrangements with copyright collectives, and court decisions. The publication is a starting point for increasing awareness of educators’ rights and obligations in selecting and using copyright-protected materials for teaching and learning. Copyright Matters! is available on-line. If you would prefer a printed copy, please contact us. The CMEC Copyright Consortium has also developed and published the Fair Dealing Guidelines to help teachers and school administrators understand how to use copyright-protected works appropriately. The fair-dealing provision in the Copyright Act permits the use of a copyright-protected work without obtaining permission from the copyright owner or paying copyright royalties if the use is considered “fair.” The Fair Dealing Guidelines apply to non-profit K─12 schools and postsecondary education institutions and provide reasonable safeguards for the owners of copyright-protected works in accordance with the Copyright Act and the Supreme Court decision. If educators copy materials, they need to know their limits by consulting the Fair Dealing Guidelines. Need more information? The CMEC Copyright Consortium has developed an on-line resource—FairDealingDecisionTool.ca—that helps teachers decide whether “fair dealing” permits classroom use of print materials, artistic works, or audiovisual materials without first getting copyright permission.